1. SEE IT FOR YOURSELF. People who work in hotels, conference centers and other venues are probably not going to lie to you deliberately, but when you ask if they have something their answer might be inaccurate simply because they don't remember and don't check. The only way to be sure is to check for yourself or send someone who you trust to do this reconnaissance for you. Want to know if there is easy parking? Go look. 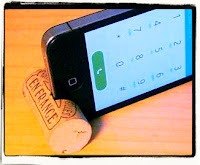 Want to know if there is cell phone coverage in a basement room Go try for yourself. Want to know if there is a projection screen? Go look, and try the button that makes the screen come down to make sure it does. 2. TALK TO THE PEOPLE WHO DO THINGS. Very often you will be talking to a representative who should pass on your questions and requests to the people who will actually do the work, but for anything that is critical you really need to talk to the person who actually does the work. Want to know if a hotel can handle a specific video format? Don't ask a manager, ask the audio/visual guy. Want to be sure that your photographer knows exactly what you want? Talk to the actual person who will take the photos, not her boss. Want the waiters to pause clearing tables during the keynote? Talk to the waiters, not the manager. 3. MAKE CHECKLISTS AND USE THEM. Your visit to a venue should be methodical and systematic. You are not there just for a quick look round; you are there to make sure everything is the way you want it to be and to identify issues that will need action. The best way to do this is to go with a checklist. 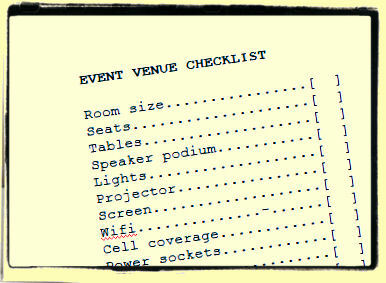 You can have a standard checklist of things you check every time, but make a specific list for each event depending on what you need to do. Every time something unexpected happens you will learn to add an extra line to your checklist. Try applying these three techniques and you will see that the number of surprises that need urgent attention will go down. And as time passes your checklists will get more complete and more effective. You are also likely to acquire a handy toolkit of essentials like power strips, duct tape and other essentials, saving a last minute trip to the mall.